To meet demand for its latest color printer, Xerox/Tektronix uses a down-and-back conveyor line and over 125 power zones for tight control. 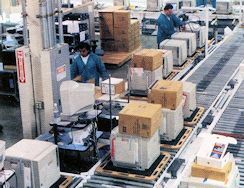 Just as simplicity is often best when it comes to computer printers, the same can be said of final assembly lines for those printers. At least that's what Tektronix (now Xerox) decided at its Wilsonville, Oregon facility. Daily, the company pumps through hundreds of its new, popular four-color printers on a down-and-back powered roller conveyor line. Over the line's total length of 136 ft, there are 127 individual power zones that direct printers on slave pallets to individual workstations in eight major areas. There, custom configuration of the printers as well as installation of hardware and software and final testing occurs. In addition to keeping the footprint of the system to a minimum, only 9,700 sq ft, the system offers Tektronix maximum control over the configuration process, says, Doug Henkle, manufacturing engineer. As a result, Henkel says the company has the ability to manage the process in whatever order needed to meet the day's orders as well as accommodate surges in throughput at the end of the quarter. Pallet loads of nearly completed printers packed in shipping cartons arrive at the facility from Japan. These are typically stored in pallet rack for 2-4 weeks in a warehouse adjacent to the manufacturing building. Parts needed to customize those printers are stored in a mezzanine area on flow rack and shelves in another section of the warehouse. After completion of the day's build order, lift truck drivers are instructed how many of which printer models to deliver to the unpack area in manufacturing. In the small parts area, paper pick lists guide workers selecting items needed for final assembly of those printers. Carts of these parts replenish flow racks located at the various workstations along the line. In the unpack area, a worker removes each carton from the pallet using an ergonomic lift and places it on a short roller conveyor. At the end of that line, the carton is manually pushed onto a ball transfer table where it is opened and the dunnage removed. An ergonomic lift then transfers the printer from the carton to a plywood slave pallet. 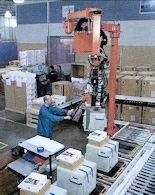 A worker places dunnage and the carton on a takeaway conveyor for delivery to the packing and shipping station at the end of the manufacturing conveyor line. There the materials will be reused to ship printers coming off the line. Before the printer leaves unpacking, a worker scans its bar coded model and serial numbers. This generates both a new bar code label used only to identify the printer on the production line and a paper printout of the hardware, software, and configuration needed to meet the customer's requirements. The bar code label is applied to the printout and scanned as needed at workstations. Although used to identify the printer, bar codes do not direct pallets to the appropriate workstations. On the side of each pallet is a reflective sliding square and a series of numbers corresponding to the individual workstations. In the unpack area, a worker sets the slider over the number designating the first workstation the pallet needs to visit. Along the side of the main conveyor, a photo eye sees the slider and indicates to the conveyor control system where the pallet needs to be delivered. 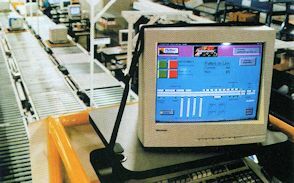 When all tasks are completed at the workstation, the worker moves the slider to the next number and releases it to the line. The photo eyes also serve another purpose-providing data needed by the software that controls conveyor operation. Acting as sensors, the photo eyes indicate when a pallet is or is not occupying each of the 127 power zones. This causes the software to activate or deactivate power in the zones. The intelligent conveyor that feeds the workstations is a center-driven roller design. At the induction point for each workstation, that zone of roller conveyor is deactivated and the pallet comes to a stop. A chain-driven transfer then pops up between the rollers and reroutes the pallet. At some workstations, pallets move directly onto ball transfer stations with a pin in the center that holds the pallet in a fixed position. In the test lanes, prep accessories, and pre-ship area, pallets travel on zero-pressure accumulation roller conveyor. Boxed printers arrive for final assembly at the unpacking station where vacuum hoists transfer them to the intelligent conveyor line for delivery to various workstations starting with control board installation. At the end of the line, the printer is transferred to the parallel intelligent conveyor for the return trip to the final workstations leading to packaging and shipping. There, completed printers are repacked in the boxes they originally arrived in and labeled for final shipment. When the pallet comes to the end of the line, an ergonomic lift moves the printer off the pallet and onto a short, parallel conveyor in packaging and shipping. 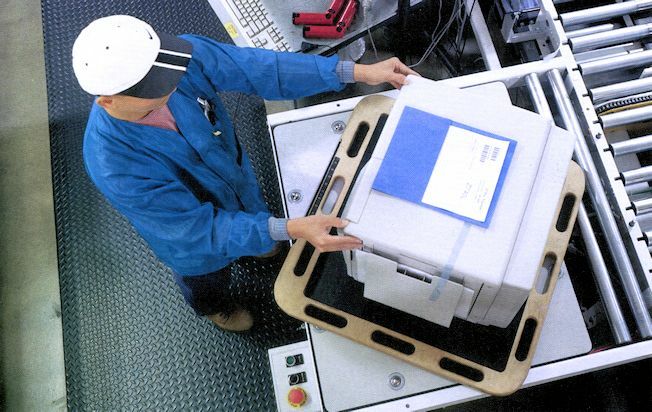 A worker scans the printer's bar coded serial number, initiating printout of a shipping label. The printer is then placed into one of the boxes saved from unpacking and the shipping label applied. Shipment generally occurs that same day. The flexibility and reliability of this line has eliminated potential problems as demand for these printers takes off.